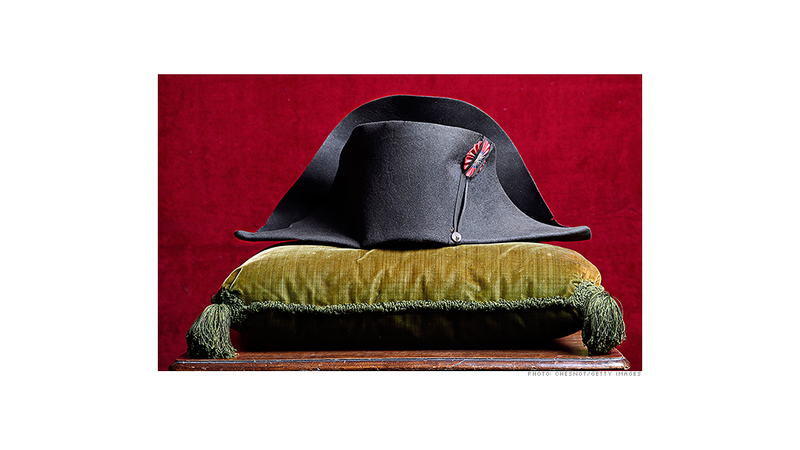 Napoleon may have been diminutive in stature, but his iconic hat has sold for no small sum. The French emperor's hat went on the auction block Saturday and sold to a South Korean collector for $2.4 million, the president of the Osenat auction house said. That sum was far more than the $500,000 that it was expected to sell for. The famous hat was one of several personal effects of Napoleon Bonaparte that went on sale. Monaco's royal family owned the items, and was shedding them to raise money for palace renovations. "I prefer to give a new lease [on] life to this collection of objects and relics ... rather than to see them remain in the shadows," Prince Andrew of Monaco said prior to the auction. Sale prices for the other items, like small medals and pairs of Napoleon's socks, were not immediately available.